Tooooooys! You can’t go wrong with toys. For anyone of any age, they are foolproof gifts. Hours: Monday through Saturday from 10 a.m. to 7 p.m.
Sunday from noon to 6 p.m. 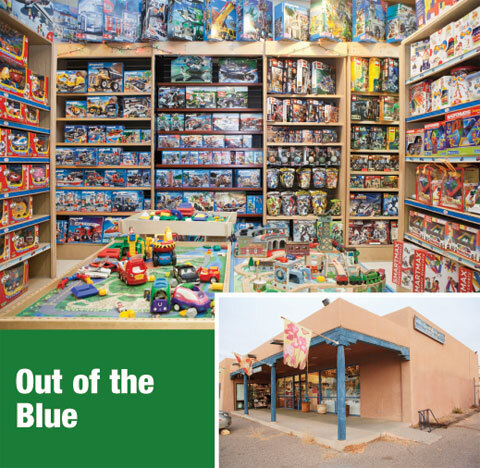 Hours: Monday through Saturday from 10 a.m. to 6 p.m.
Sunday from noon to 5 p.m.
Our readers have voted Out of the Blue the best toy store in Albuquerque some gajillion times. And with good reason: This store’s got hundreds of toys for newborns, pre-teens and adults, too. Hours: Tuesday through Thursday from noon to 6 p.m.
Friday and Saturday from noon to 7 p.m. The jolly magicians at The Magic and Juggling Shop take their craft very seriously, which means they have some seriously amazing tricks and trinkets in the shop. Card trick sets and DVDs of parlor magic make great gifts for the magic novice. Or try out a starter set with everything a blossoming trickster needs to perform, including a dozen tricks, a velvet table cloth and an insurance policy (’cause sometimes the willing volunteer just never reappears). Hours: Monday through Saturday from 11 a.m. to 7 p.m.
Now this is a comic store. Whether you’re shopping for an avid collector or a casual superhero fan, Lobo Anime & Comics has something for every lover of graphic action. And they have a drool-worthy collection of action figures and toys—new and vintage—that are sure to please.